As with any business, you begin by looking at your market. Then you listen to what it has to say. If you don't someone else will. This page is a first step in that process. 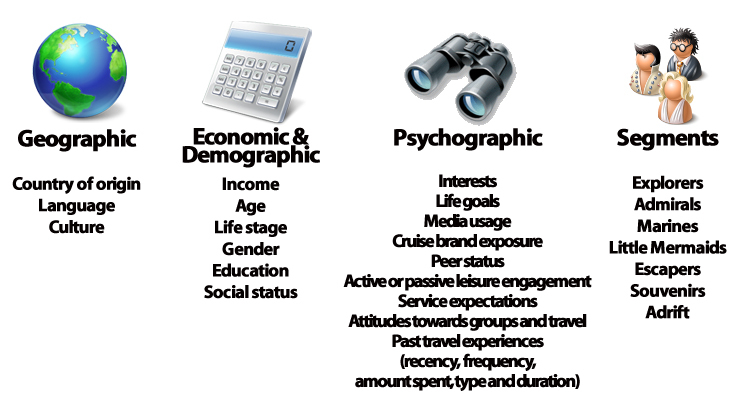 Source: U.S. Market Demographics from TNS, Cruise Lines International Association 2014 Cruise Market Profile. The graph below illustrates a number of variables that predict cruise behavior, and how they might aggregate to form market segments. Explorers- The segment we love to love. These folks take four or more vacations per year, have disposable incomes and take longer cruises, exotic cruises and cultural learning cruises. Education and social causes are important to them. So are making friends and socializing. It’s a smaller and more saturated segment, but one that is lucrative and important to satisfy to retain their business. This group also represents future opportunity, as more couples become empty nesters and retired upscale boomers. Admirals- These folks have selected their preferred cruise provider and seek a traditional experience. They tend to ritualize their travel experience and don’t usually experiment unless their favorites start to become stale or so radically different the attributes they admired become unrecognizable. Great cruise consumers, they tend to be older and a good, loyal customer base but offer less opportunity for growth. Marines- This desirable yet elusive segment is made up of upscale, motivated and active young professionals. They are most likely to snorkel, para-sail, surf and rock climb. Whether new or experienced cruisers, they are always auditioning better ships. They are intellectually curious, media-involved, and they perceive value in not only the appearance of being active but also the reality of learning and being challenged. Cruise companies can grow well in this segment. They are the logical target for active ship design strategies as well as expanding Internet marketing. Little Mermaids - This segment is made up of upper middle class families. They are experiencing an increase the pace of daily activity and a crunch for time. With every non-working moment devoted to family errands (stopping at the Home Depot to pick up an attachment for the air pump for the kids pool or running to Target for a new basketball for the son’s friends birthday party) they are looking to maximize leisure activity as a family experience that includes opportunities for real quality-bonding. Escapers - This is a desirable segment and probably the core of the cruise market. They are just looking to get away. All-inclusive is just fine. No complications, no worries. From their point of view, after having spent a hectic year in the rat race with traffic jams, bad tempered people and an abundance of things that need to be done, they have earned the pleasures of doing nothing but sitting by the pool, seeing a few sites and relaxing. They are somewhat price sensitive but will always find the money for the trip they deserve. Souvenirs - These folks have jobs (not careers) and lives (not lifestyles). Because the exact line isn't as much a priority for them as price, their cruise habits skew toward just taking a trip more than specific destinations or activities. Lacking intense interest in the world outside they are primarily focused the internalized experience of the moment. They tend to take a cruise vacation only when there’s a “really good deal” that everyone’s talking about.